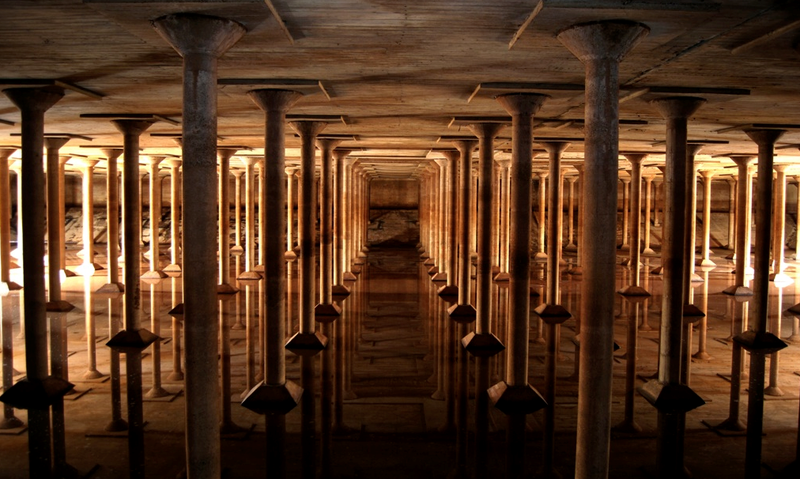 The Buffalo Bayou Park Cistern was built in 1926 to supply drinking water to the growing Texas city. Over 15 million gallons of water were stored here until the 1970s, when a mysterious leak was discovered that eventually put the reservoir out of commission. In 2010, as the land above the cistern was being transformed into a park, architects pried open a hatch and were stunned at the cave-like room filled with 221 columns. Like London’s Thames Tunnel or DC’s Dupont Underground subway station, these long-abandoned feats of engineering are being re-opened and re-appreciated by new audiences who are transforming relics of a city’s past into a new kind of civic space. Like those spaces, the cistern was once slated for demolition—and at one point, planned to be a parking garage (??? )—until the city saw the value of keeping it around. The cistern officially opened last weekend, and tickets can now be purchased for visits, although it looks like they’re sold out for quite some time. For those who don’t have tickets, a periscope at the surface gives a peek at what lies beneath. You can even “view” it through a fairly convincing web experience that recreates the feeling of discovering the cistern for the first time.